Welcome to the City of White! 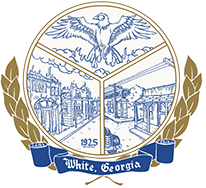 The City of White, Georgia is named for its first Postmaster, James A. White. The original charter is dated August 7th, 1919 as The Town of White. This was amended in 1962 and it became The City of White. White is located in Bartow County in Northwest Georgia. Relatively steep ridges and broad valleys characterize Bartow County’s topography with elevations ranging from a low of approximately 600 feet (where the Etowah River leaves Bartow and enters Floyd County) to an approximate high elevation of some 2,400 feet. NOTICE: Trash cans must be at the street for the trash department to be able to get it. We understand the frustration with the closing of Richards Road and apologize for any inconvenience. Unfortunately, the closure was needed for the safety of our residents and visitors to our great city! As an alternate route, please use Cass-White Road or West Rocky Street.